In the late 1960s I lived for a few months high up in La Crescenta, 2,500+ feet above Los Angeles along the edge of the Angeles National Forest in the San Gabriel Mountains. The apartment was the ground level of a home carved into the mountain side on steppes not far from what is now Deukmejian Wilderness Park. It was spring and the days were crisp and clear and the views out over the Verdugos to the ocean were spectacular. This section of the national forest had been established by the federal government as a “forest timber preserve” in 1892 during President Benjamin Harrison’s administration and combined with two others to become a national forest 15 years later during Teddy Roosevelt’s. That forest preserve was established only a decade after the Southern Pacific Railroad linked Los Angeles to the east coast and created a land rush. Having swollen from a population of 40,000 in 1881, when the Southern Pacific and Santa Fe linked up, to more than 100,000 by 1890, Los Angeles County was already very worried about its water shed which the forest preserve was in part created to protect. By the time I lived along those mountains, the population of the county below was already nearing 7 million and now, forty-four years later, it is up to 9.8 million. What cattle ranchers considered a joke some 130 years ago, that they gave the land away but sold the climate has come to be prophetic today. Maybe they didn’t know enough back then to to realize that the value of wetlands and parkland would be priceless when it comes to protecting water quality. Nor did they realize the value of those lands in flood control, especially their ability to retain sediment from storm run off. As High Country News reported last week, the flood control in the San Gabriels was initiated not only to protect lives and property and water quality but to prevent the recurrence of sediment flows that plugged LA’s harbor at San Pedro after fires and heavy rains in those mountains resulted in flash floods in 1914. 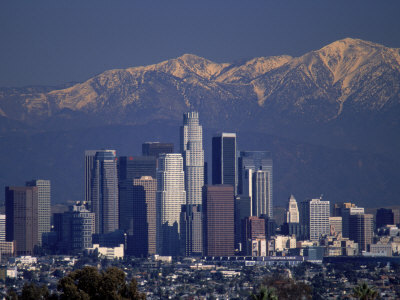 At the time of Dana’s description, Los Angeles with a population of 800 was undergoing a growth spurt and had just been declared a city by the recently independent country of Mexico. By the time of the land rush that came with the railroad in 1881, the cattle herds Dana mentions were grazing clear up to where I would live for those few months 132 years later. By 1914 when the harbor nearly filled with sediment, Los Angles County’s population had swelled to nearly 800,000. As a result, river beds were lined with concrete and dams erected along the washes coming down from the mountains. Today instead of sediment being captured and settled in wetlands along the way, it has to be captured and removed from dams. Running out of places to “dump” the sediment means engineers are making unfortunate decisions to destroy forests of old-growth oaks and sycamores to create dump sites. The free market is miraculous but it obviously wasn’t capable back then of understanding or incorporating the value of protecting the lands necessary for water quality and flood control, nor is government protecting old-growth forestland now. I’d like to return to La Crescenta one day to motorcycle the spectacular 116 mile loop through the Angeles National Forest beginning just a few miles downrange on the Angles Crest Highway, going up through the mountains, along the backside on Big Pines Road and returning through the mountains via the Angeles Forest Highway and down through Big Tujunga Canyon Road, emptying out again just up range. "Unfortunate" doesn't describe enough the decision to build that wall and cut down all those trees. It's downright tragic to think that, if those decisions weren't made, the city wouldn't be unblocking drains and moving sediment.